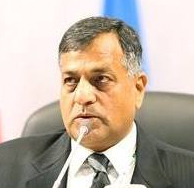 The government has named Ashok Lavasa, a 1980 batch IAS officer of Haryana cadre who is currently secretary at the department of expenditure at the finance ministry, as the new finance secretary. Finance secretary is an additional designation sported by the senior most among the secretaries manning the five departments of the finance ministry. It does not represent another job function but signifies the person who is first among equals in the most high-profile bureaucratic unit of the central government. The ministry of finance has five departments and separate secretaries for different units, including economic affairs, expenditure, revenue, financial services and investment & public asset management (formerly disinvestment). Lavasa had taken over the position of expenditure secretary in April from Ratan Watal who retired last month. Watal was also the previous finance secretary. Watal had taken over as the finance secretary in August last year in place of Rajiv Mehrishi who was transferred to the home ministry. The government had a choice of naming Lavasa or Shaktikanta Das, currently economic affairs secretary, as the new finance secretary. Das is of the same batch as Lavasa, from the Tamil Nadu cadre. The government had made a raft of changes in the bureaucratic corridors soon after it took over in May 2014. Interestingly, Ratan Watal, a 1978 batch IAS officer, was the only one who retained his role at the finance ministry even after the change in the government. In the past, some of the finance ministry mandarins had their roles shuffled. For instance, Shaktikanta Das, who was serving as revenue secretary, was named secretary, department of economic affairs. Hasmukh Adhia, secretary of financial services department, was named revenue secretary.